Schwartz 103 is not a revisited classic turning technique or some new example of how to create an object of wonder on a wood lathe, but a tribute to a member of our club. May I introduce Mr. Jack Schwartz of Hanford, California who was born on April 27, 1915. 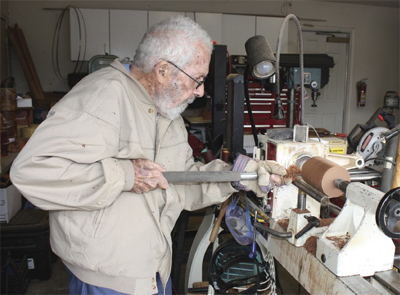 Yes, you read it correctly, Jack Schwartz is 103 years old this year and an active member of the Sequoia Woodturners Club. Schwartz was born in San Francisco on April 27, 1915, grew up in Hollywood and graduated	from high school when he was just 15. At the age of 16 he started study from the California Institute of Technology earning a degree in civil engineering. Schwartz joined the Navy Civil Engineer Corps in 1940 and was a Navy lieutenant j.g. stationed in Guam as an engineer,	which was “the wrong place to be” when war was declared on Dec. 7, 1941 with the bombing of Pearl Harbor. He was taken prisoner when Guam was invaded on Dec. 9, the third day of the war. Schwartz spent 1,367 days (3 years and nine months) in a Japanese POW camp, an experience he didn’t wish to recount in detail. Schwartz kept a diary during most of his captivity that he still has. “Got a tangerine, 1/2 an apple, 2 caramels, + a cup of chocolate with toast,” one entry states. “Food is No. 1,” he said. His first camp was Zentsuji. “It was a show camp” to which Swiss Red Cross officials were brought and Admiral Tojo visited, so conditions were less harsh, he said. “They did not make the officers go to work,” he said. He also spent time at camp Kawasaki 2B in the Tokyo area. “I was beaten a few times but not that severely,” he said. In his living room is a framed pencil sketch showing Schwartz doing sailor’s macrame (he unraveled a hammock to acquire the string), and the words Happy Birthday Jack and signatures of his fellow captives. A fellow officer drew it. “That’s one of my treasures,” he said. Schwartz said he knew more or less what was happening in the war because the Japanese published an English language newspaper throughout the war and copies would circulate. Later, he wrote a study about how each country’s media reported the war. “Everyone likes to report they are winning,” he said. After atomic bombs were dropped on Hiroshima and Nagasaki, Japan surrendered on Aug. 14, 1945. Two days later at the Rokuroshi camp in the mountains outside Hiroshima, “the Japanese commander came in and said ‘hostilities have ceased,’ and they walked off and left us there,” Schwartz recalled. The newly free prisoners wrote POW on the rooftop. A B-29 spotted it and planes began dropping boxes of food. Two weeks later, rescuers arrived. Schwartz returned home, married his sweetheart, raised a family, lived in Paris, Panama, New Mexico and other locations where the Navy needed engineers, and retired as a commander. After retirement, Jack made his home in Hanford, California and became the public works director for Hanford from 1962 to 1980. In 2014, he visited Japan as a guest of the Japanese government with six other former POWs. They toured rebuilt barracks at a camp, visited a Buddhist shrine that kept a list of names of 40,000 POWs who died in Japan, attended a reception with U.S. Ambassador Caroline Kennedy, and stopped at the Hiroshima atomic bomb memorial. Japanese media covered it and the visit was reported by The Washington Post. Schwartz is philosophical about his return to a country he first saw through a fence. A couple of years ago, Schwartz attended an event honoring prisoners of war at the VA Hospital in Fresno and has travelled with his good friend Don Wilcox to Washington D.C. as a member of the California Honor Flight Program for World War 2 veterans. He has served several years on the Kings County Grand Jury and could be seen regularly sitting in the front row at Hanford City Council meetings. When he’s not serving the community, he’s an avid woodturning enthusiast, making things like platters, bowls, wine glasses — and a lot of sawdust. While he sells some of his work, he gives most of it away as gifts. Jack recently won May’s club challenge, with a pair of lathe turned multi-colored woman’s earrings. Jack and Don spend hours together in Don's garage, turning beautiful artifacts for the art show crowd. “You have to keep busy,” Schwartz said. Over the years, he said he watched Hanford transform. He remembers when the busy corner of 11th Avenue and Lacey Boulevard was a cornfield. But overall, he said, some things never change. Schwartz attributes his longevity and continued activity in the community to clean living, hard work and good genes. Update: On November 7th, 2018 Jack passed away. Our prayers go out to the Schwartz family. What an amazing American and friend. Information for this tribute was provided from articles written by Mike Eiman of the Hanford Sentinel, Lewis Griswold of the Fresno Bee and Bud Elliott - a freelance writer. Photographs by Bud Elliott and Mark Dillon.